In October, Valpak invites you to visit valpak.com/komen and enter the Celebrate the Heroes Sweepstakes for a chance to win. 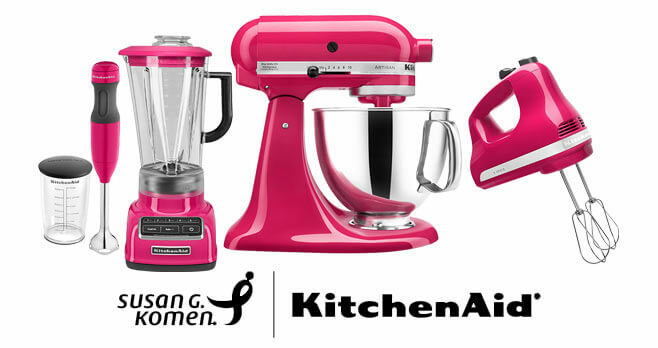 Up to 25 lucky winners will receive KitchenAid appliances in support of Cook for the Cure. The Valpak Celebrate the Heroes Sweepstakes is open only to legal residents of the 50 United States and the District of Columbia who are eighteen (18) years of age or older, or the age of majority in their state of residence, whichever is older at time of entry. The Sweepstakes begins at 12:01:00 a.m. (EDT) on September 25, 2018 and end at 11:59:59 p.m. (EDT) on November 2, 2018. Only one (1) Entry per person during the Sweepstakes Period. The grand prize consists of KitchenAid appliances (2-speed hand blender, stand mixer, 5-speed hand mixer, and a blender). Visit valpak.com/komen to enter and see Official Rules for details. My mother, Margaret, is my hero. When I was diagnosed with breast cancer she was the first one I told. She watched my children when I had doctor appointments or chemotherapy treatments and my mother lent me money to help pay the rent when funds were tight because of my medical bills. My mother is and will always be my hero. I am a breast cancer survivor today because of her!